“I think there’s a reasonable possibility that she will be a leading scholar in her field, if you want to look 10 to 15 years down the line. I think that would mean that she would have earned a reputation as a very original and thought-provoking scholar who looks at the problem of race in American history and in general,” said John Bodnar, IU Bloomington distinguished and chancellor’s professor of history. “I envision her having developed her dissertation into a successful book that a lot of people pay attention to. I can see her developing some working relationships with museums and other interpretive sites to try to develop a more inclusive version of U.S. history,” said former IU Bloomington professor Christina Snyder, now the McCabe Greer professor of history at Penn State University. “My expectation is by the time she finishes her post-doc, she’ll at least have a contract to publish her first book, I think it’s going to make a big splash. I’m a historian of the 19th century—I’m not a specialist in Native American history or in African American history—but from my perspective, what she does is completely recast Reconstruction and what that might mean,” said Wendy Gamber, IU Bloomington Byrnes professor of history. The praise the aforementioned trio of renowned scholars is dispensing would be remarkable even if they were discussing the work of one of their peers. But to have so much faith in the scholarship of one of their recent doctoral students gives weight to the idea that Alaina Roberts is poised to be a major name in her field. Roberts, who recently received her Ph.D. from IU Bloomington’s department of history, wrote her dissertation on African Americans in Oklahoma who were enslaved by the Chickasaw Indians, which is certainly unique subject matter on its own. But add in the fact that Roberts’ own family descends from the people she was studying, and it’s easy to see why her research is so intriguing. “I started doing research on my father’s family as an undergrad at UC Santa Barbara. They’re African American, they are white, and they are also Chickasaw Indian. And they were also not slaves of white people; they were slaves of Chickasaw Indians. I found out that there had not really been much research done on that at all and so, I wanted to tell the story of my ancestors and other people like them,” explained Roberts, who will be embarking on a post-doctoral fellowship at Penn State this fall. Again, there’s no denying that her research is fascinating. 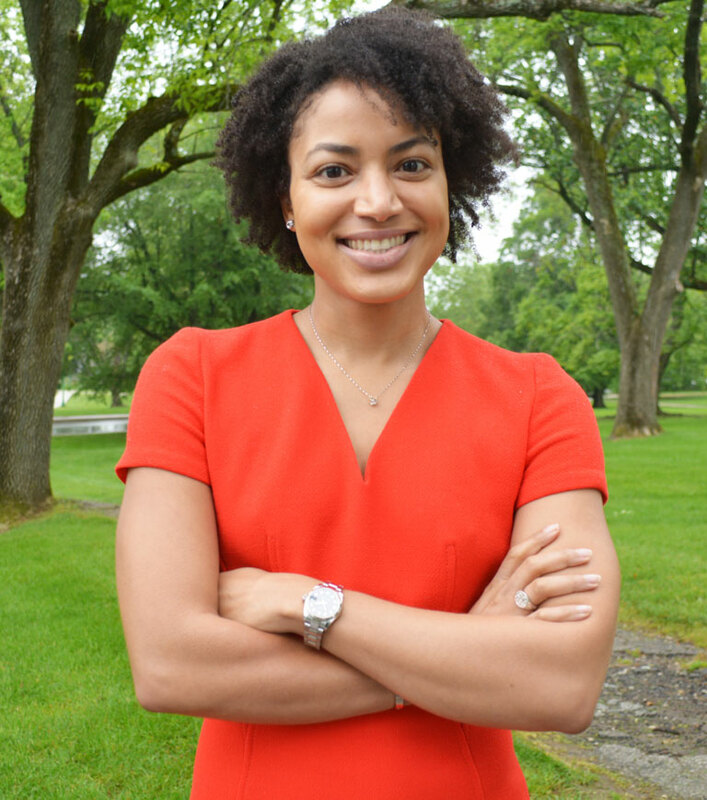 But what makes her academic work even more impressive is that Roberts earned her doctorate at only 26 years of age, making her the youngest African American woman on record—to the best of IU’s research capabilities—to receive a Ph.D. from IU’s history department. She was really driven, and that’s what always struck me. She was very focused. She was very good at setting goals for herself and achieving those goals, and I think that is one thing that is so important as a scholar. “It means a lot that I had the backing and support of my parents and my family, as well as the mentors that I had as an undergrad and at IU, because coming across the country just to do research, it was a scary experience,” said Roberts, who hails from Northern California. “Also, Indiana is obviously less diverse than California, so that was a big change for me. I had a lot of hard times—times when I thought I wouldn’t make it through the program, times when I wanted to quit. I wondered if I was smart enough to finish. While in Bloomington, Roberts was obviously focused on her studies, but still found time to be otherwise involved on campus. For example, she facilitated a film screening of “American Red and Black: Stories of Afro-Native Identity,” bringing in University of Massachusetts Amherst scholar Barbara Krauthamer for a discussion beforehand. The well-attended event, held at the IU Cinema in the spring 2016 semester, was supported by: IU’s Office of the Vice President for Diversity, Equity, and Multicultural Affairs (OVPDEMA); the First Nations Educational and Cultural Center, an OVPDEMA program; and IU Bloomington’s history and anthropology departments. Though Roberts may prefer to concentrate on her work and let the results do the talking, her former professors still marvel at both her accomplishment and bright future. I see her sense of originality and her interest in sort of complicating or understanding race relations and ethnic relations in America as the ingredients that would allow her to make a scholarly mark and be a well-respected historian and scholar down the road. “She was really driven, and that’s what always struck me. She was very focused. She was very good at setting goals for herself and achieving those goals, and I think that is one thing that is so important as a scholar. You really have to be self-motivated to succeed, and I think that she’s more self-motivated than most graduate students. She was willing to work very hard and she had a lot of confidence in her project, so her dedication to that research that she felt so passionately about,” said Snyder, who was Roberts’ primary adviser at IU. Added Gamber, who recruited Roberts to IU: “What really stands out is her discipline. She finished in five years, and she came in without a master’s. I know of very few students who accomplished that. She came in very motivated and in fact, enhanced her motivation and commitment, and she finished in record time. That takes a kind of discipline and drive that not all graduate students have and frankly, not all faculty have. She’s just a delightful person, wonderful to know, very confident but also someone who very gracefully receives criticism and takes that as incentive to improve and runs with it, so I’ll miss her.